Steam Donkey will run again this year thanks to community support! 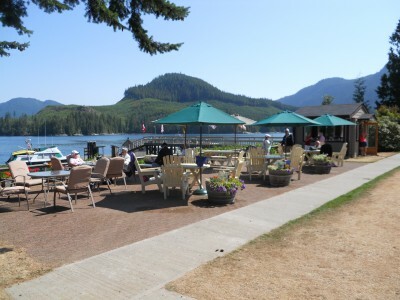 This year’s Labour Day celebration at the Museum at Campbell River came close to having to be cancelled due to problems with the Steam Donkey that were identified in an inspection earlier this year. 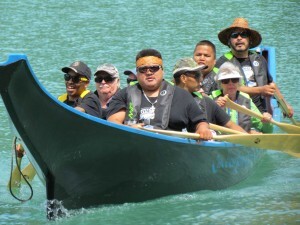 This annual event is attended by hundreds of people and is the biggest event happening on Labour Day in Campbell River each year. As soon as the problems were identified, Museum staff and volunteers started to look for solutions, knowing they were on a tight deadline. Thankfully due to efforts on several fronts, the festivities will be able to proceed this year as scheduled. Norm Grant, who operates the Steam Donkey for special events put in countless hours working at getting it back into running order. He had previously helped rebuild some valves during the restoration of the Museum’s Steam Donkey, then Norm Fair talked him into volunteering to run it starting in 2006. “He’s a great arm twister” Norm explains. 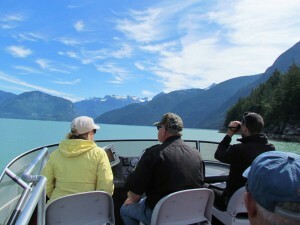 Not only does Norm give up his Labour Day and sometimes Canada Day to run the Steam Donkey, he also meets annually with the inspector from the B.C. Safety Authority to ensure the machine remains safe to operate, and does any work needed to keep it in good running order. Several local organizations were instrumental in meeting the tight deadlines. CR Metal Fabricators contributed donated time and materials to build a new smoke stack for the Steam Donkey, and the Campbell River Daybreak Rotary Club stepped up with a grant to cover repair costs. 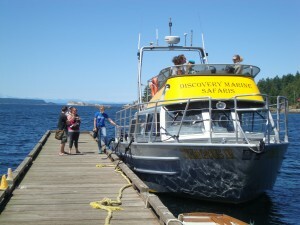 Blake Leisch and welder Alfie Boudreau also contributed to the project. 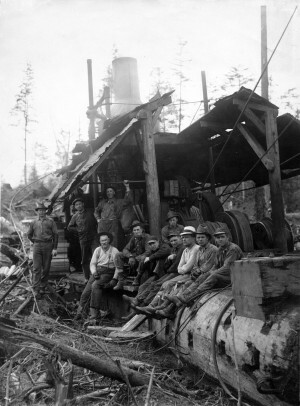 The Steam Donkey required a series of non-destructive tests to prove that it was safe, and Kodiak Non-Destructive Testing Services from Nanaimo did the testing and donated their time and expertise to do it. Overall it has been a community effort, and now the Museum is pleased to invite you for Labour Day, Monday, September 4, from noon to 3pm, to see the Steam Donkey running once again. 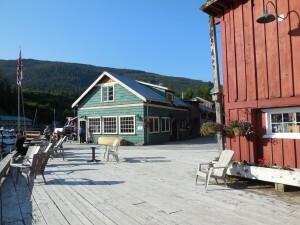 The popular donkey boiler coffee will be served, and the Glacier Heritage Equipment Club from the Comox Valley will be joining in this year with some of their antique tractors as well as a pole lathe demonstration. Artist Pavel Barta will be there with a newly designed paper model of the Steam Donkey, and the Museum Lego collection will be out for free Lego play. 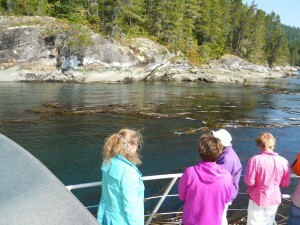 For more information go to www.crmuseum.ca or call 250-287-3103. 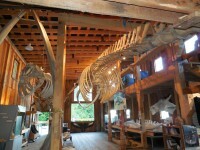 The Museum at Campbell River is located at 470 Island Highway. This article appeared in Campbellton Magazine in 2014 and we are posting it here today as a tribute to the Quinnie that burnt down last night. 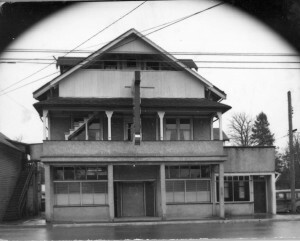 An enduring symbol of old Campbellton, the Quinsam Hotel was built almost one hundred years ago, and is one of the few remaining heritage buildings in Campbell River from this time period. It has survived through several owners and several eras, and continues to be a popular gathering place and unpretentious drinking establishment. 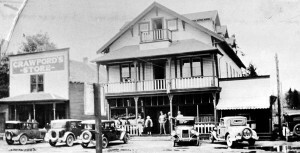 Affectionately known as “the Quinnie”, the hotel was under construction in 1917 but had an inauspicious beginning; it was the same year that Prohibition was enforced. Since the builder, Tom Laffin had counted on alcohol sales to support his investment, he sold it while it was still under construction and dubbed it ‘the White Elephant’. He only needed to wait a couple of years – Prohibition was short lived and ended in 1920. 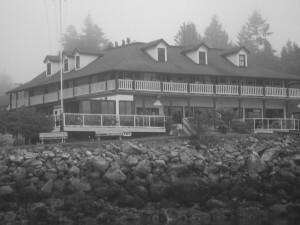 Ken Bergstrom completed construction on the hotel, and was soon doing a roaring trade. The third owner of the hotel, and one who had a colourful reputation was Jim English. He was known about town as a character, and was nicknamed ‘the Bishop’. 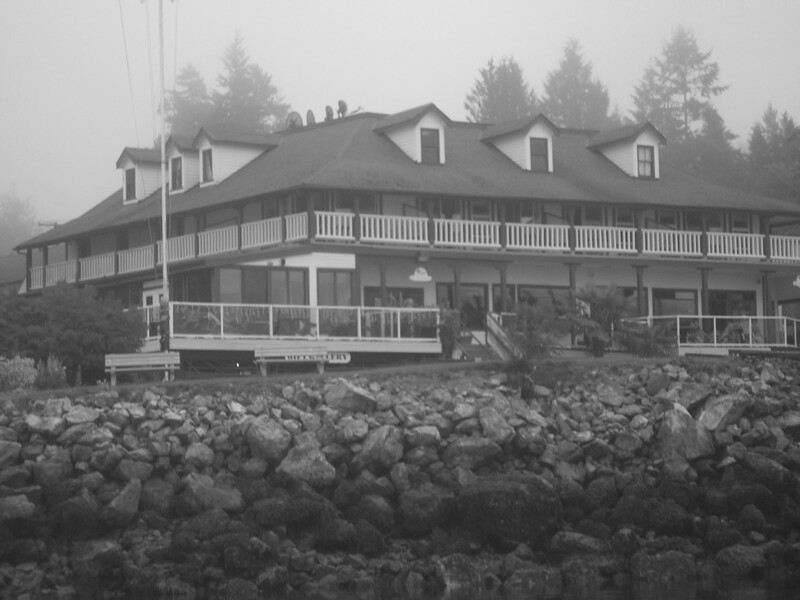 English wasn’t new to the hospitality business; he had been operating a bootlegging business out of the Fisherman’s Lodge in Oyster River, and he used the proceeds to purchase the Quinsam in 1923. At a point near where the Island Highway swings close to the Campbell River, there has sprung up a settlement which has grown amazingly of late, namely, Campbellton, and near to the centre of it is the Quinsam Hotel. It is run by Mr. Jim English, who has expanded it until it has become the chief building of Campbellton. 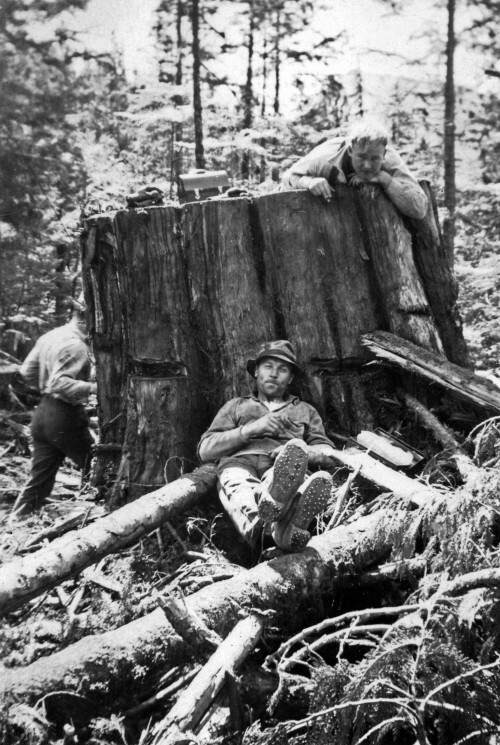 There were always a large number of loggers coming down the International Timber line, and the hotel was established primarily to cater to them, and twenty two rooms are provided where they can stay in comfort. English owned the bar for just over 35 years, then in 1959, Jack Ross went into partnership with him. By this time English was no longer actively participating in the business, but he continued with his bootlegging – buying cases of liquor from the liquor store to sell to the customers who couldn’t get there before the 6:00pm closing time. Ross remembered that English wore special pants that could carry and conceal his bottles, and he would walk down the middle of the street selling his wares. When Jack Ross bought the bar, he knew nothing about the business but was looking for some independence and a way to make money. He was good with math, and after reviewing the financial figures for the ‘Quinnie’, thought it would be a good investment. He soon found out that he possessed another useful talent. He had received training in wrestling while living in Edmonton, and this came in handy when he had to break up fights, which were a common, if almost daily occurrence. His son-in-law Bruce Izard said that Ross was friends with the then famous wrestler Gene Kiniski who would come to the hotel to see him, but Kiniski couldn’t have a drink in the bar as so many fellows would challenge him to a fight. Ross and Kiniski would have to meet in one of the hotel rooms to have their visit and share a drink. When Ross took over the Quinsam, he kept the existing staff but worked the bar himself for the first few years. He found that he like the bar business; “I could BS a lot” he said. 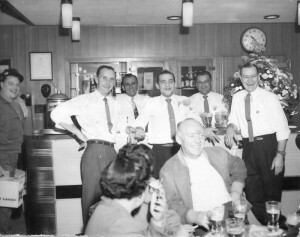 He had many regulars and made a point of knowing his patrons and calling them by name. In those days, the Quinsam was strictly a beer parlour, and in his opinion, “it was the nicest place to drink”. It wasn’t long before he decided to expand and in 1961 bought Crawford’s Store next door. The beer parlour went from 125 to 200 seats, the cafe was added onto, and eight new hotel rooms went in above. With the need for reception staff, waitresses in the cafe, cooks and extra bar staff, he had between 20-25 people working there. 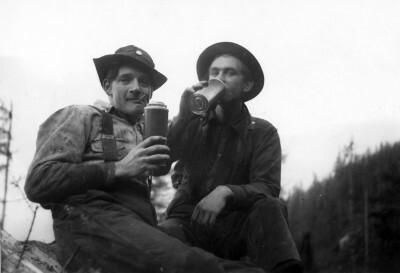 Laws governing drinking establishments were quite rigid at that time. One of the most challenging liquor laws to abide by was having to close the bar from 6:30 to 7:00pm; the idea being that patrons would go home for supper. Ross said that it was often difficult to convince them to do so. The tap was cut off at 11:30pm, and the establishment closed at midnight, and the bar was not allowed to be open on Sundays. By 1967, Jack bought out the business from Jim English’s son Bob. They were busy years. Ross and his wife had six children and at one point he became President of the Rotary Club. A couple of his children worked in the bar and his oldest went on to study hotel management and to run the Arbutus Hotel in Courtenay. While Ross owned the Quinsam, he said that only men served in the bar, and in those years there was no entertainment. He sold in the Quinsam in 1976 to Eli Katz who changed the name to the ‘Kerdan’. Katz had the idea that there should be entertainment in the form of dancing girls, so he put plywood over the pool table to make a ‘stage’ for them. He sold the hotel to an insurance adjuster who did away with the dancers and lost money. Katz went on to purchase the Douglas Hotel in Victoria. Jerry sold the business to John and Bonnie Uzzell. Their daughter Crystal said her father John was a very hands-on owner, and despite having a manager, would do every job from clearing tables to getting behind the bar. Her mother Bonnie worked more behind the scenes and looked after the books and other details. It was a family affair, and Crystal and her husband Mike Modras operated the café for many years. During the years the Uzzells owned the Quinsam, they procured a licence to sell liquor and opened the liquor store that was attached to the building at the back parking lot. Crystal has fond memories of all the regular customers, who were very supportive when the family lost John Uzzell to a tragic accident in 2001. His wife Bonnie sold the business in 2009. 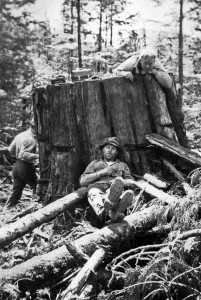 It was then purchased by the Cape Mudge Band. General Manager Blair Wells says that the only change the Band made was to move the liquor store and its licence to their property at Quinsam Crossing in 2011. Other than that, the hotel has remained the same, with live bands playing Fridays and Saturdays, karaoke on Sundays and Thursdays, and daily food specials. The café is still a popular spot for breakfast and lunch. As Blair Wells says, “It’s a one of a kind place, not a cookie cut like so many of today’s pubs.” It could be this sense of uniqueness and the feeling that the Quinsam retains ties to the past that keeps people coming. Today’s patrons enjoy the old fashioned ambience the ‘Quinnie’ provides – like a place where time stands still. Before the proliferation of modern fast food restaurants with their “drive-through” came the more social and certainly less rushed version, the “drive-in” restaurant. An automobile culture was emerging across North America. At drive-ins, carhops would clip trays on to the car windows and patrons would enjoy their meal in the comfort of their own vehicles. The drive-in was the place to be. The first drive-in restaurant opened in 1921 in Dallas, Texas, although it would take time before the idea became wide spread. 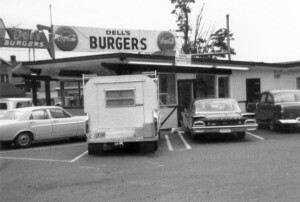 In 1951 the concept arrived in Campbell River with the opening of Del’s Drive-In. Del’s offered the complete drive-in experience, including carhops in go-go boots and green and white uniforms. It quickly became a meeting place where teens would come every night with their music blaring. Del and Betty Pelletier began the restaurant, and then after leasing it to others sold it to Del’s brother and sister-in-law Ernie and Joyce Pelletier in 1960. 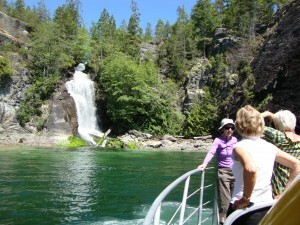 “Every weekend in the summer it would be busy busy. All the kids would come, and they would even have little dances out in the parking lot. They would get all of their radios going and it was a fun place to be,” recalls Joyce. When Ernie and Joyce bought the restaurant they were only 28 and 25 years old respectively, and had 2 young girls. Over the next few years their family grew to 4 kids with the arrival of 2 boys. “When we first got started if someone had come in with a $50 bill we couldn’t have changed it. It was scary, I would go home at night and wonder if we were going to make it through another day, and we did. We hit it off really good with the kids that patronized us. They would be sitting out on the hoods of their cars and we would be sitting inside talking to them through the window. Then we would say ‘let’s close up early and go to the dance!’ We would close up at 11 instead of 12, take off and party until 2 in the morning and then be back at it at 9 the next morning, 7 days a week. It was a very demanding job, but it was fun, we had a lot of really good help.” Ernie and Joyce’s daughter Yvonne remembers her and her sister helping out with the family business. “One of the things I remember when sis and I were young , about 5 and 7, we would go down and help out at the restaurant. There was a big machine that was a potato peeler would scrub potatoes and get peels off, then we would put each potato in the chipper that would make the chips. Everything was fresh. We would also make the hamburger patties. The hamburger was from the butcher in Black Creek. It came in the brown butcher paper. It was defrosted overnight and it would still be partially frozen in the morning and we would freeze our little hands mixing the ingredients in. Then we would use an ice cream scooper and scoop them into hamburger press and put them on cookie sheets in the fridge. It was one of our chores – helping out in the restaurant. We would also help mom cook the pies and pastries. We would make cherry, raisin and apple pies. We would make 20 to 30 pies at a time. When we got older we would waitress at the shop and help out that way.” The kids helped with all sorts of jobs, such as prep work and sweeping the lot in the morning. Although not currently on display, the Museum has in it’s collection the orange and blue neon sign, featuring an ice cream cone and the words “Del’s Burgers”. This sign had replaced an earlier, less ornate sign that read “Del’s Drive-In”. 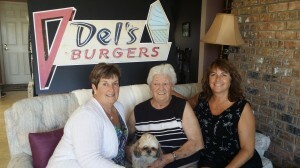 Recently a photograph of the Del’s Drive-In sign was enlarged so that graduates of Carihi High’s class of 1975 could have their photo taken with it. According to Dave Tabish for the class of ’75, Del’s was a gathering place where kids would go for lunch or meet up after school. 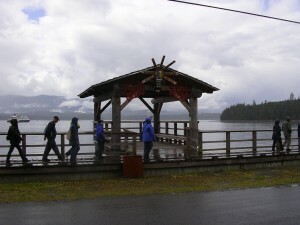 In front of the Museum is a pole carved by well-known Kwakwaka’wakw carver, Sam Henderson. Originally raised in front of Campbell River’s Centennial Building this Kwakiutl Bear Pole was part of the 1967 centennial project “Route of the Totems”. Unfortunately, time and elements have weakened the Pole, which has been extensively restored in the past, and it has reached the point of being beyond repair. Master carver Bill Henderson, the son of Sam and current head carver at the Campbell River Indian Band’s carving shed, has been identified as the lead carver for a replacement pole. This new pole will be a testament of the continuing carving traditions in our community. The Museum plans to take this opportunity to document and film the carving process. This will be a valuable resource for the Museum, as well as for the community. It will record not only the details of the carving of this pole, but also the culture of the carving shed and the methods used to mentor young carvers. It will allow us to see how the knowledge of carving is passed from one generation to the other. 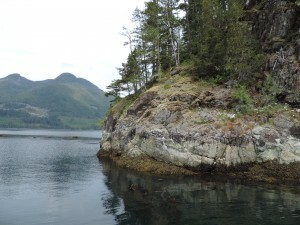 Recently, The BC Arts Council and the Government of British Columbia have awarded the Museum a grant to assist with the commissioning of this 22-foot pole. We are thankful for the help to move this project forward, and hope to have the pole started in the near future! 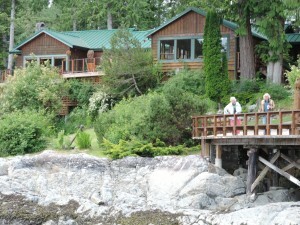 I worked alongside my Dad, Sam Henderson in his carving shed here in Campbell River from a very young age. I watched him work, listened to him talk about our history, his life and where we came from. Not only did I learn to carve under his guidance but I learned my culture and the importance of giving back to my community. Today I am the Head Carver at the Campbell River carving shed which opened in 2000. Like my Dad, who passed several years ago, I teach, guide and mentor the next generation of carvers. I remember working with my Dad, in the 1960’s on the Bear Pole which now is located in front of the Museum. The crests depicted came from my mother’s side of the family. Under my Dad’s direction I worked on the face on the front of the top Thunderbird figure. This pole, which was part of the Route of the Totems commemorative project in 1967, has been part of the community for a long time. Over the years it has decayed and has been repaired, by myself on more than one occasion. It is now at a point that it can no longer be repaired and will soon be taken down. This pole will be the inspiration for a new pole that I will carve, as a commission for the Museum. As Head Carver I will guide and direct my nephews and other carvers as we work on this pole. I am proud of my nephews and it will be a time to learn and to strengthen our ties to our culture. Once completed the pole will be located in front of the Museum, which is a very prominent location. The new pole will be a reminder for many years to come of our culture and the strong legacy left by my Dad and myself as I followed in his footsteps. As we work on the pole I am happy to welcome the Museum staff to the carving shed to film the process and interview those who will work alongside me. I understand that this footage will be included in a short documentary that the Museum will produce on the making of the pole. This film will add to public’s understanding of the pole and will serve as a record of it’s creation. I look forward to working on this pole and with the Museum on this project.